Carandiru ﻿is a true story about a rebellion in a Brazilian prison and the action taken to quell the rioting , it’s an older movie ( 2003 ) but stars Wagner Moura of Enemy Within fame. 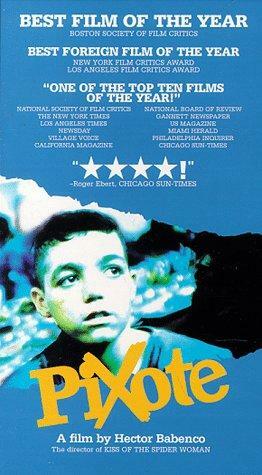 Saw that, as well as director Hector Babenco's "Pixote" (1981). Both films have interesting subject matter, imo not handled too well. "Pixote" had a great trailer featuring the greatest images in the film, two of the scenes are unforgettable as short clips, so I had great expectations but the film wasn't as intense. I like to know as little as possible about a film before I see it. The first time I saw this I didn't catch Bernal's character's last name, and it was I think before he was nicknamed, so I didn't realize who he was portraying. Thought the film was great. Then on 2nd viewing I caught on. Interesting throughout, but very subtle in the character's change thru the experiences he has on this trip. There's some extra material available that has a contemporary interview with his companion on the journey Alberto Granado (played by Rodrigo de la Serna). Haven’t seen Pixote but will look it up. I lived in Brazil for 20 years so have great affection for these movies. In fact anything with Wagner Moura or Rodrigo Santoro is worth watching IMO . “An emotive journey of a former school teacher, who writes letters for illiterate people, and a young boy, whose mother has just died, as they search for the father he never knew.” from IMDB. Not an action movie like the others just a pleasant story giving insight into Brazil’s poorer inhabitants. which the wife does, twist at end, and Agatha from Vikings,cleans up very well. "Central Station" is directed by Walter Salles ("The Motorcycle Diaries" director I mentioned above). After seeing "...Motorcycle..." I watched his earlier films. I'd recommend you watch all of those - Salles is Brazilian and the films all take place there as I recall. ("...Motorcycle..." is his best film - although I don't think I've seen any of the films he's made since that one). "Behind the Sun" ("Abril Despedaçado") (2001) is about a blood feud between two rural families. And I see it stars your man Santoro. I'm pretty sure it was in "Central Station" that I saw something cultural I found quite interesting - it may have been the man and the boy, but someone wants to speak to people he doesn't know who are in their house. He stands on the sidewalk and claps his hands rather than walking up their walkway and knocking on their door. The people in the house hear this and open the door to see who it is. Did you ever observe this in Brazil? I was recommended this movie 'T-34'. I can't find a site to download it. Help. Yes, clapping of the hands to get someone’s attention inside the house is very common , sometimes putting your hands through the gate or fence and clapping to get closer. Usually accompanied by “ o, de casa “ ( hey, you at home ). Regular old style western, you know who the good guys and bad guys are and you know it's all going to end well. I loved this film, especially the nods to Tarantino; no clue why it gets such bad reviews when John Wick 1/2 (which I also loved) get showered with critical praise? Too many shows to keep up with. I enjoyed a””Polar”, but did not think it was great. Really enjoying this Turkish show. All ten episodes with subs available on TPB. Summary: In his profession, experienced captain Seyfi and rookie policeman Nuri Pamir face a child murder in the city. This murder leads them to the city's populated business man Abbas and his daughter Dilara. Destroyer, with Nicole Kidman, better than average, gritty crime movie. Saw a screener version, so imagine it's available most places.